The Aqua Cutter 410A Evolution may have a big name but it is very small in size. 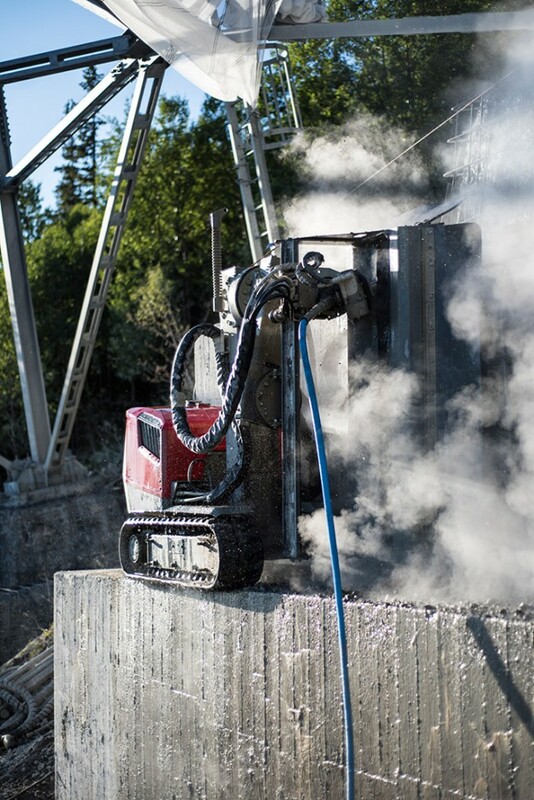 This Hydrodemolition robot is designed to replace the traditional method of hand-lancing. Hand-lancing is a very physically demanding form of Hydrodemolition which can cause fatigue among operators which results in a lack of concentration making it quite a dangerous method. However, this method uses a robot as opposed to humans, making the task more time-effective, efficient and most importantly, safe. To find out more about Hydrodemolition and the various methods available, visit our Hydrodemolition information page. The compact design makes this robot perfect for small and confined areas. As well as being small in size, the Aqua Cutter 410A Evolution is a lightweight model allowing for use on structures such as scaffolding. The robot has an articulated arm which has two rotating joints and three extensions which can reach up to 3m (9,8ft) making horizontal, vertical and overhead work easier than ever before. The robot can be controlled wirelessly permitting operators to work at a safe distance from the demolition work. The wireless control allows you to drive the robot into tight and inhospitable environments. This tool keeps a preset distance from the nozzle to the concrete surface which reduces wasted energy and keeps the water-jetting at a consistent and powerful speed. The difference between the classic Aqua Cutter 410A and the Evolution model is that the Evolution model includes highly computerized robotic management, allowing the operator to program in geometrical shapes such as circles, squares and triangles creating a more sophisticated and professional hydrodemolition result. AQUA CUTTER 410A waste water plant – Aquajet Systems from Aquajet Systems on Vimeo. If you are unsure about whether the Aqua Cutter 410A Evolution would be suitable for your task then don’t hesitate to contact us as we are pleased to offer helpful advice for your unique situation. Call us on 01677 428 786, email us at [email protected] or fill out the contact form below. We look forward to hearing from you.